Getting Started Tips, Tricks, Small Blips. This is a quick start up guide for using Houdini with yt. You can download Houdini from the SideFX website right here. Note, you can choose to buy a license or go with an "Apprentice" license for free. There are some limitations with the free license including a maximum resolution of 1280x720 for images and a watermark will appear on each image. For the full range of supported and unsupported features with each sort of license please refer to the SideFX comparison tables. where the "##" refers to whatever Python install Houdini is using. 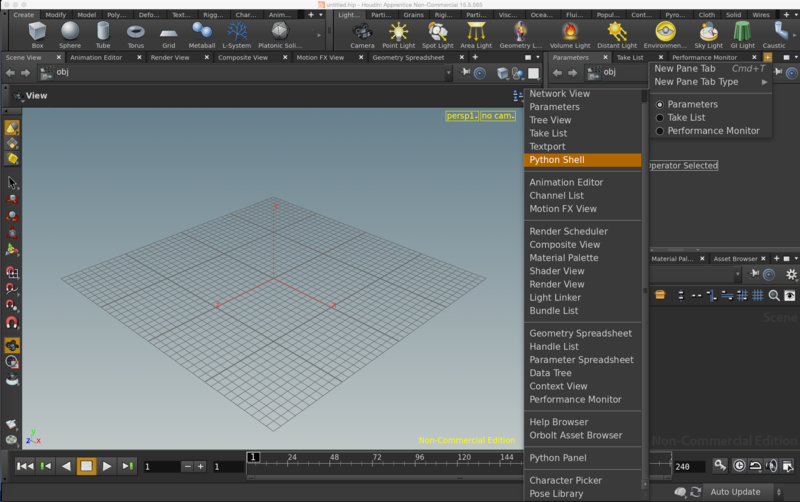 You'll want to make sure both the Houdini directories and yt installed Python libraries are in your path. Things are a little bit easier in Houdini 17, as you just need to set a Python start up script to point to the correct paths. Note: this process assumes you have root privileges and aren't afraid to use them. Install Houdini locally if this isn't something you want to be a part of. We are not responsible for any harm improper use of sudo causes, and have not fully tested if this installation breaks anything else. pip installation is following instructions: here and installing the "six" package is following ideas here. Then one must simply type "import yt" into this console to check that everything imports ok.